According to the WHO, about 30 million people are estimated to be permanently blind worldwide. These people are totally dependent on others. They even cannot walk on their own. We have created designed and built an “Ultrasonic Blind Walking Stick” device which will help blind people to walk with ease independently. As a simpler version, we have used only one ultrasonic sensor in this project. For better accuracy and assistance two or three sensors can be used. The main objective of this project is to help blind people to walk with ease and to be warned whenever their walking path is obstructed with other objects, people or other similar odds. As a warning signal, a buzzer is connected in the circuit, whose frequency of beep changes according to the distance of object. The closer the distance of obstruction, the more will be the buzzer beep frequency. We can say that the beep frequency is inversely proportional to the distance. 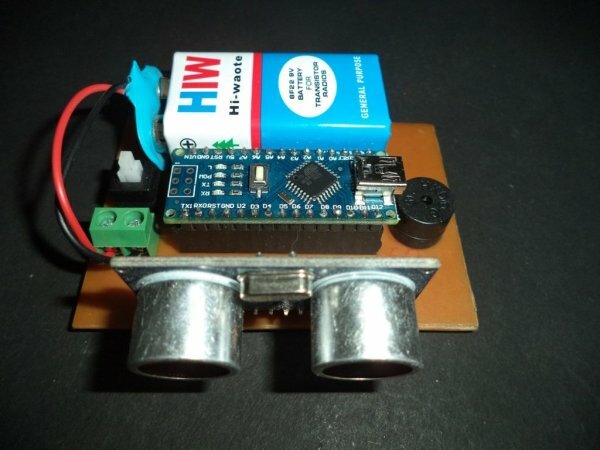 The main component used for this device is the ultrasonic sensor. The ultrasonic sensor transmits a high frequency sound pulse and then calculates the time to receive the signal of the sound echo to reflect back. The sensor has 2 circles. One of them acts as the transmitter and transmits the ultrasonic waves. The other one acts as a receiver (mostly a small microphone) and receives the echoed sound signal. The sensor is calibrated according to the speed of the sound in air. With this calibrated input, the time difference between the transmission and reception of sound pulse is determined to calculate the distance of the object. This circuit is powered by a 9-volt battery through a switch. Ground which is connected to GND pin of Arduino. 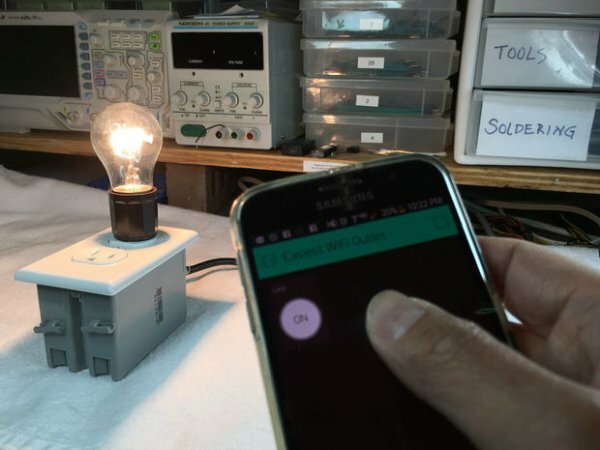 Positive terminal of 9-volt battery is connected to Vin pin of Arduino through a DPDT switch and the negative terminal is connected to GND pin of Arduino. 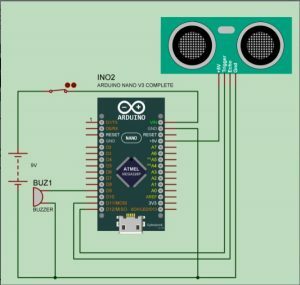 A buzzer is connected between D9 pin of Arduino and GND pin. The whole project has been designed on Eagle. The same circuit prototype can be made using a breadboard or zero PCB. The circuit diagram and PCB design are given below. As shown in diagrams there are two openings in Ultrasonic sensor first is transmitter (or Trigger) and second is receiver (or Echo). Ultrasonic sensor sends high frequency pulses, these pulses reflects from object and takes as Echo, time between echo and Trig is measured by the microcontroller or Arduino which is directly proportional to distance. The speed of sound is 341 meter per second in the air, and the distance between sensor and object is equal to time multiplied by speed of sound divided by two.